In the past several years, honey and cinnamon have become stars in the realm of complementary medicine. Both are rumored to cure or at least help manage all sorts of ailments, including diabetes. While both honey and cinnamon have properties that may benefit health, their usefulness in controlling diabetes is debatable. According to the American Diabetes Association (ADA), available evidence does not support the use of cinnamon or honey as a means to improve blood glucose levels. More human research is needed to understand if these items have a future role in diabetes management. Diabetes is a long-term condition that causes elevated blood glucose levels, so it may seem counter-intuitive to link this carbohydrate-rich food to improved diabetes control. However, there is some preliminary research that suggests honey could improve blood glucose levels. When diabetic rats were given both honey and one of two diabetes drugs -- metformin or glibenclamide -- their blood glucose levels improved more than those given only the medication, according to a study published in the March 2011 "International Journal of Biological Sciences." The authors postulate that honey's high fructose content -- a simple sugar that has a neutral effect on blood glucose -- may be one of the reasons for the noted benefits. Of interest, it's unknown if humans eating honey from the United States would have a glucose-lowering benefit, as this rat study used tualang or wild rain forest honey, which has a higher fructose content compared to U.S honey. For humans with diabetes, honey is a known source of carbohydrates and has the potential to increase blood glucose levels. But the limited human research on honey and blood glucose control provides mixed results. A review article published in the January 2014 "Journal of Diabetes and Metabolic Disorders" reviewed a study showing that blood glucose was improved when honey was added to the diets of youth with type 1 diabetes. But the article also reviewed another short-term study in adults with type 2 diabetes (T2DM) in which added honey worsened A1c levels, a measure of average of blood glucose control. It's unclear if the study design or source of honey influenced results. Additional research is needed to clarify any role honey may have in diabetes management. Interest in cinnamon as a therapy for T2DM stems from evidence that it may improve cholesterol profiles and lower blood glucose levels. A spice extracted from the inner bark of evergreen trees, the most common types of cinnamon are cassia cinnamon, or Cinnamomum aromaticum, and Ceylon cinnamon, or Cinnamomum zeylanicum. While the health benefits of both types of cinnamon have been studied, cassia cinnamon is the most common one sold in the United States. One of cinnamon’s active ingredients is cinnamaldehyde, which is believed to improve insulin action in the body. Another active ingredient, methylhydroxychalcone polymer, which can help the body to metabolize glucose, might also add to cinnamon's glucose-lowering effects. The role of cinnamon in diabetes has been debated due to mixed research results. A review of pooled research involving 543 study subjects published in the September 2013 “Annals of Family Medicine” concluded that consumption of cinnamon was associated with improved fasting blood glucose and improved blood cholesterol and triglyceride levels. However, the review found no significant reduction in A1C levels -- an important measure of glucose control over a 2- to 3-month period. The study noted that current available information is not sufficient to recommend cinnamon as part of a systematic treatment plan, partly because the lack of manufacturing standards and quality control is an obstacle to cinnamon research. One tablespoon of honey contains approximately 15 grams of carbohydrate, which is about the same as 1 slice of bread or a small fresh fruit. While this amount of honey is an effective treatment for most episodes of low blood sugar, ADA recommends natural sweeteners such as honey either be avoided or factored into the diet the same as other carbohydrates. A dietitian can provide carbohydrate targets and education on how to factor carbohydrate foods into a meal plan. Cinnamon can be used freely as a spice in a diabetes meal plan, but because of the lack of strong evidence of cinnamon's benefits, ADA does not currently recommend cinnamon supplementation for people with diabetes. The potential role of nutritional supplements in treating diabetes is the subject of ongoing research. As of 2016, ADA does not recommend any nutritional supplements for improvement of blood glucose control because of insufficient evidence to prove effectiveness. 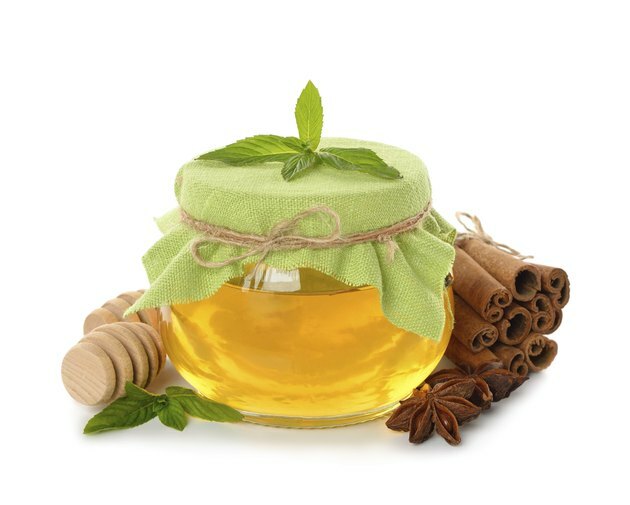 While honey's only known side effect is a potential increase in blood glucose levels, large doses of cinnamon have the potential cause liver toxicity, increase the risk of bleeding and could cause side effects in people taking blood-thinning medications or cholesterol-lowering drugs, according to the review in "Annals of Family Medicine." Anyone planning on taking large doses or supplements of cinnamon should discuss these plans with a doctor, since adjustments in diabetes medication may be needed. Also, anyone with diabetes should not stop any prescribed medications without first consulting a doctor.